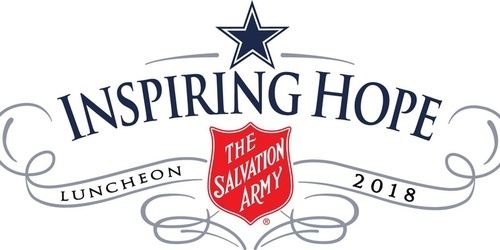 We hope that you will join us on Wednesday, May 2, 2018 for The Salvation Army’s Fourth annual “Inspiring Hope Luncheon” to benefit Arlington, Mansfield and surrounding communities. Enjoy a fabulous lunch with an inspirational speech from our keynote speaker all while taking in the view from the field of AT&T Stadium. Please join us. Your involvement will inspire us all to action to help our community realize a brighter future.